A centralized management interface is always what system administrators desire for. QCentral is a Java-based centralized management tool. As long as you have Java Runtime Environment support in your personal computer either notebook or desktop, QCentral is executable on that platform. It’s a quick access to all Qsan storage systems with all necessary functions. The beauty is that all web GUI functions are integrated into QCentral applicaiton including system status, enclosure management and volume settings. You don’t need to open a web GUI for each storage system. They all consolidate into “One” window. 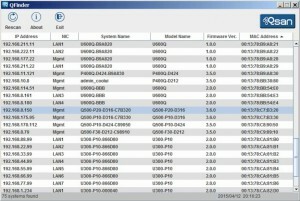 It’s a very convenient tool for IT administrators to manage all Qsan storage arrays in the same local area network. In some production environments such as surveillance, you need to prepare a number of storage systems with the same settings and configurations. It takes time to go through each storage system manually. EZConfig helps you solve this problem. Like QCentral, EZConfig is a Java-based tool with cross-platform capability. EZConfig supports AegisSAN product line only. The idea is quickly replicating the same settings to different storage systems. EZConfig is a must-have handy tool for IT adminitrators when it comes to deploy a great number of storage systems with a similar fashion. 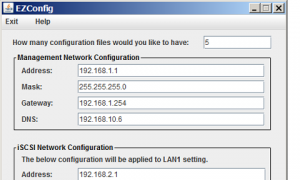 After entering the necessary numbers, EZConfig will generate a series of configuration files. Copy those files to an USB drive and plug in the USB drive to the RAID controller USB port before powering up the storage. During booting, the storage itself will check the existence of the USB drive with configuration files inside and perform the necessary settings according to the configuration file. Storage system will always use the first configuration file according to the file name (descending alphanumeric order). After booting completes, the current file will be removed and the USB drive is ready for the next storage system. IT administrator doesn’t have to go through the Web UI each time. All he needs to do is plugging in USB drive, waiting for booting, and plugging out the USB drive. Repeat the cycle until all storage systems are set properly according to the configuration files. As the name says, QFinder is a storage finder to locate storage arrays in the local area network. It really comes in handy when you set up storage system for the very first time. If you forgot the management port IP address, you can always count on QFinder to find out and connect to the target for you. Like QCentral, QFinder is a Java-based tool as well. It has cross-platform capability. You can run QFinder in Windows, Mac, and Linux operating systems. And of course, QFinder can only locate Qsan storage systems. It will not find out storage systems of other brands in the network.